Summer is a good time for teachers to read a little about their profession, think, ponder and grow. See my list below and please comment and add your own recommendation. The list are books written by a teacher about their life and times as a teacher. No essays, no philosophy and rants about the educational system – just relating what happened to them as teachers and how they felt about it. One of the “homerun” books that really got me to be a teacher was A.S. Neill’s Summerhill ( Download a preview ) He spoke in his own voice and that spoke to me. I felt like I was at the school and stepping through the hallways with him and his students. EFL Classroom 2.0 members can download many recommended readings in our Essential Books category. 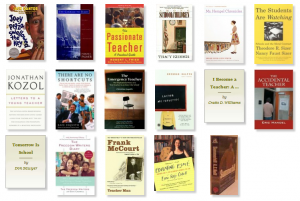 Here’s the list I used to give my students at teachers’ college, to start the year (see many in detail on my Goodreads list). Maybe something will inspire you to do some summer reading! Which of these are EFL teachers? Quick answer – not one (except for the one I mentioned at the beginning). Says something about how TEFL is on the pecking order of education me thinks. Still, lots to learn from these teachers. I started a book a year ago during my summer break and looking at this list made we wander if I could actually finish or at least resume my writing. Thanks David, my upcoming piece of content would be on teachers helping teachers through books and your post has helped me a lot. The best thing teachers can do (other than students) is assist their colleagues, because I believe they have gone through the same situation thus their way is more helpful.